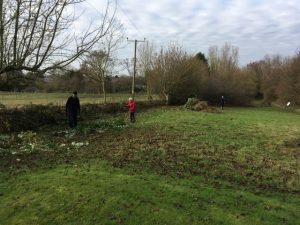 The regular volunteers have been hard at work over the past three months. 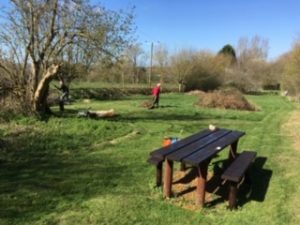 We have cut back hedges and brambles; removed dead trees and cut the grass so the park is looking at its best. We hope you will visit over the Easter break and after. 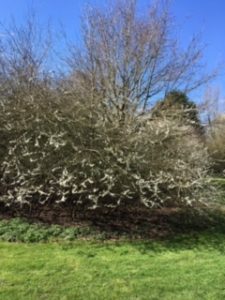 You can spot primroses and maybe some late daffodils in the wooded areas and banks, and all sorts of wild birds on the bird feeders and in the trees. Parents are encouraged to bring their children so that they can enjoy being outside playing in and exploring the park. 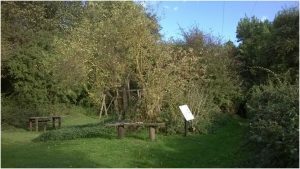 The Pocket Park is a ‘managed’ environment; which without regular maintenance would quickly become overgrown with nettles, brambles and Blackthorn making access impossible. We would really appreciate your help with this! Local resident, Tim Ball continues to mow (with the pocket park mower) the paths about every 10 days or so during the growing season. If you could offer to help with this, we’d like to hear from you. The next tidy up will be on Sunday, 28th April, 10.30 in the park. Please feel free to talk to any of us for more information or to call myself or Tim. Sue & Tim Ball 660489 Susan Kennedy; Sue & Ralph Clayton, Charles Lees (Parish Council). If you are visiting over the coming weeks you should be able to enjoy the displays of Snowdrops and native narcissus. Soon to come into flower will be primroses, with clumps of foliage appearing along the woodland path showing where the spathes of the Lords and Ladies will be. The pocket park is a ‘managed’ environment. If it was left completely alone the brambles & nettles would grow wild, followed by the blackthorn. Very quickly it would be impossible to walk along the paths to see the flowers and hear the birds. 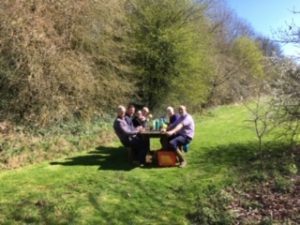 Currently five volunteers meet about once a month to keep the paths clear, build homes for local bugs and have a bit of fun in the fresh air. If you would like to join us please come along on Sunday 24th February 10.30. 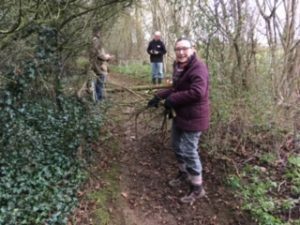 An on-going project in the park is to clear dead wood from the wooded areas on both sides of the pathway from the Welsh Road to the top meadow. 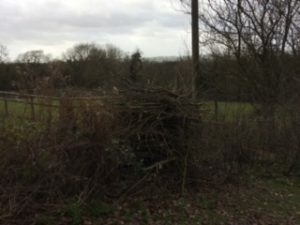 This will allow more light into this area which should encourage the growth of a more interesting range of plants including the native wild flowers that have been planted over the past few years. We’re also creating log piles to create homes for bugs and reptiles. We made a good start on this during our work session in November last year and will continue in January and February 2019. All this effort will hopefully culminate in a big bonfire in early March. Preparing for the big bonfire! We continue to maintain the park through the winter months, weather permitting – our next session will be in January 2019. The park is there for all to enjoy – we just ask that you keep your dog on a lead and ‘Poop scoop’ and take any litter home with you. The site is very sheltered with lovely views to the west. There are several picnic benches and seats together with swings for the children to enjoy. This is quite a peaceful and secluded ‘wild’ area where anyone can go to take time out from the busy lives we all seem to live, and where children can run about in a safe environment. 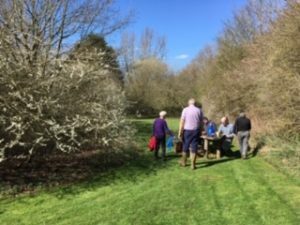 We usually meet in the park on the third Sunday of the month at 10.30 for maintenance followed by coffee and biscuits, but sometimes this can change so look at the astonlewalls.org website for updates or phone us. 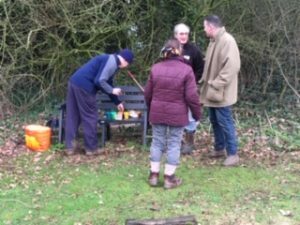 Our local WI group kindly agreed to purchase a new bench for the park to replace the one that was given to the park around 23 years ago and was showing signs of rotting. The new bench is made of recycled plastic and was installed in the top meadow in January. If you would like to help with the management of the Park or if you have any suggestions for improvements, you can use the website to make suggestions or contact Sue & Tim Ball 660489. Some interesting feedback was received as a result of the survey sent out in the autumn last year, together with two new volunteers to help with practical work in the park. Hopefully the results will be published in full soon. You can always contact me using my email address if you have any suggestions of ways to improve the park. We would like to look at updating and adding to the children’s play equipment in the Pocket Park particularly as we know there is some interest in this within the village. We’d love to hear from anyone who might be able to help us with this; whether it is with practical skills or maybe with applying for grants.